Share the post "Lena Struwe’s Personal Bioblitz Connects People with Nature"
This is the first documentation in 100 years (and first known photo) of the rare harvestman spider species, Eucynorta conigera. It was spotted in Costa Rica during the 2015 Personal Bioblitz. Photo: © Lena Struwe, Dept. of Plant Biology, 2015. ‘Count one, count them all’ – anyone with a Rutgers connection can photograph wild species in citizen science project. 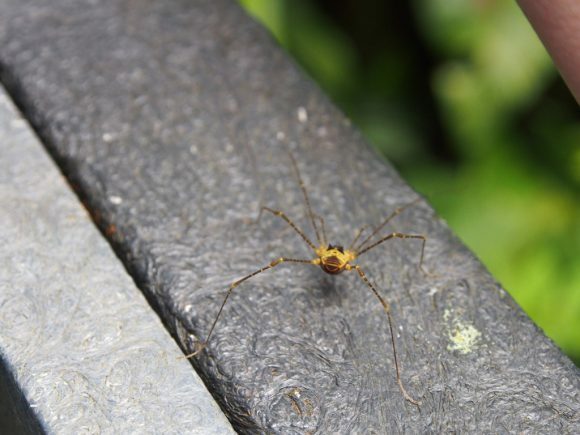 When Lena Struwe was hiking in the Monteverde Cloud Forest Biological Reserve in Costa Rica three years ago, she spotted a yellowish harvestman, a spider-type animal, on a hiking trail rail and took a photo with her camera. It turned out her photo of the long-legged arachnid, Eucynorta conigera, was the first ever of that species and only the third sighting of it ever reported. The identification was made by zoologist Stuart Longhorn in the United Kingdom, based on her photo during the 2015 Spring Personal Bioblitz at Rutgers University. The Bioblitz is aimed at getting people to learn more about life around them, to collect species data for scientists and to promote conservation in an era of rampant habitat destruction. It is open to anyone with a connection to Rutgers, including students, faculty, staff, alumni and their family members and friends. After signing up and downloading an iNaturalist smartphone app, participants take photos and record the sounds of species on Rutgers campuses and anywhere in the world from March 1 through May 15, 2018. All observations, which are easy to report, must be uploaded onto the iNaturalist website by day’s end on May 25.
iNaturalist focuses on wild and naturalized species that survive without human assistance, so photos of pets, for example, are not welcome. This Bioblitz is a collaboration of Rutgers–New Brunswick and iNaturalist (California Academy of Sciences). 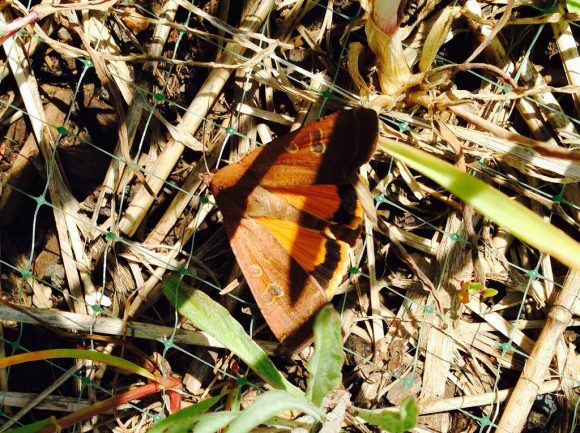 This moth, a large yellow underwing (Noctua pronuba), was found in the IFNH Wildflower Meadow on the Cook Campus at Rutgers University-New Brunswick during the 2016 Personal Bioblitz. Photo: © Lena Struwe, 2016. During last year’s Bioblitz, 55 people recorded 4,874 wild or naturalized species, and observations totaled 20,823, a world record. Struwe, who hopes those records can be surpassed this year, noted that the project is aimed at countering “species blindness,” when people not only lack knowledge of the myriad life forms in their midst, but also don’t see them to begin with.